A man plays Pokemon while commuting home from work inside a train in Bangkok. 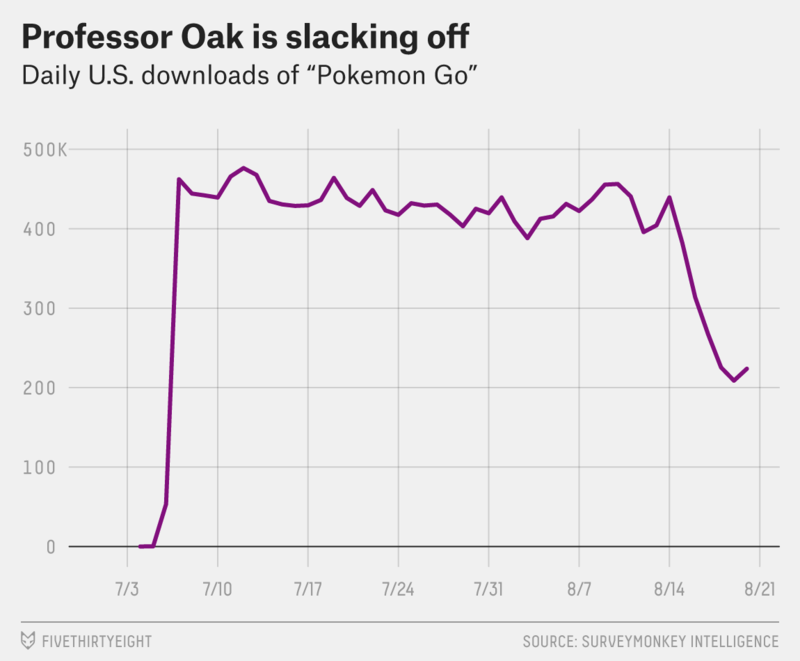 “Pokemon Go” — the smash hit app from Niantic that powerfully combines augmented reality with the bottomless well of nostalgia for pokemon — is seeing its userbase drop faster than my respect for anyone who picked Bulbasaur as their starter pokemon. As was recently pointed out by Bloomberg, daily active users are down, as is overall engagement. 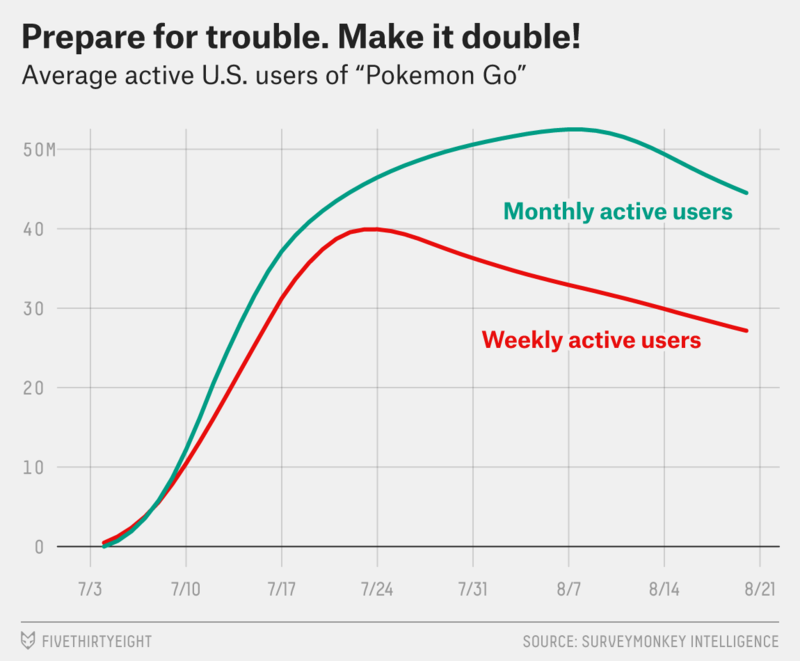 And indeed, it’s hit the point in its release where the initial buzz has worn off, and the new normal of “Pokemon Go” is beginning to take shape. SurveyMonkey Intelligence, a tool that draws from a large panel of smartphone and tablet users to determine the popularity and specific usage of mobile applications,1 has some additional stats on the game’s decline. Fewer people are playing the game than after its release in the heady days of early July, when it seemed like all we could talk about was people finding corpses just as often as they found a Snorlax. That may be because the game can be somewhat tedious after the initial thrill; or because its creators tweaked the way to find nearby pokemon, and in doing so miffed some users; or because certain apps that make the game easier are now banned. Downloads have been slowly dropping since the release, as we would expect, but since Aug. 14 there’s been a major drop in sign-ups. Part of this decline in sign-ups might relate to the social nature of the game. The Pokemon series has always lived and died based on social participation, from trading and battling pokemon through Game Boy game-link cables to the scavenging social elements of “Pokemon Go.” A decline in widespread play could, thanks to the very nature of the game, lead to a decline in sign-ups. And since launch, daily active users have leveled off. Sure, there’s a slight tick up on the weekends, but from its third weekend on, less than half of the app’s monthly users played in a given day. By last weekend, it leveled off at less than a third. 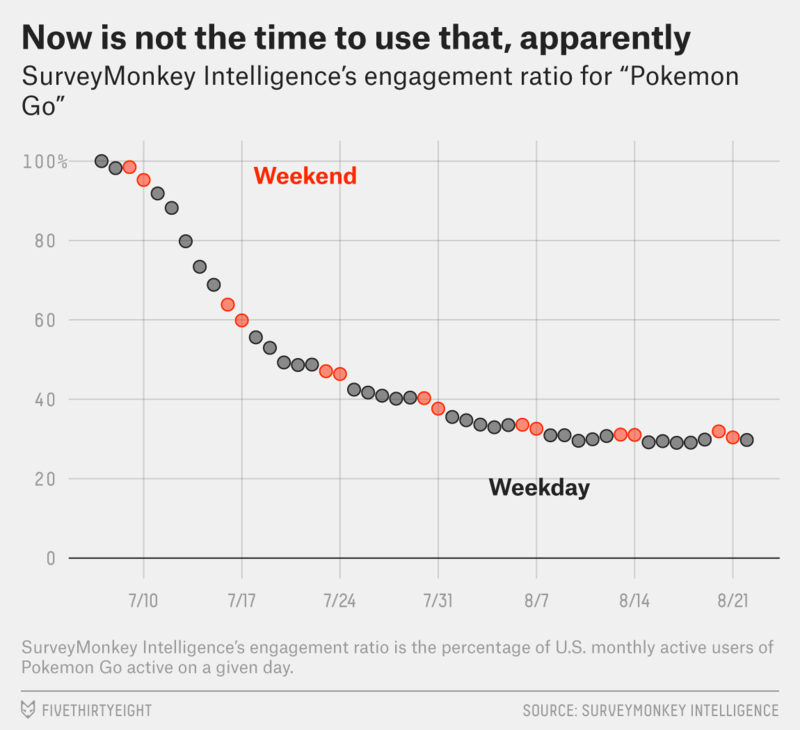 So with only around a third of monthly active users even playing on the weekends, maybe the recruiting power of “Hey, who wants to meet up and catch pokemon?” has finally run out. Users of “Pokemon Go” are vastly young and in cities: 89 percent live in urban areas rather than rural areas, and 44 percent are age 18-29. These aren’t exactly people with a dearth of other things to do. Will the game bounce back? Will we go back to the kind of frenzy that’ll lead to some teenager trying to push a truck off of a pier to find Mew? Will people once again pretend their dad works at Niantic to convince people they know how to catch a Zapdos? Give it a couple weeks to find out if that 30 percent weekend participation rate is the floor, or if it’s just a checkpoint on the way further down. SurveyMonkey takes a group of users of its apps who opted into mobile monitoring, determined various demographic weights, and scaled that to what they know about the broader U.S. smartphone user base. The monthly active users trail by 30 days; the weekly active users trail by seven.